Positive number: ALL numbers greater than zero in addition to zero. Positive numbers are ALL numbers greater than zero in addition to zero. We typically use mostly positive numbers in our daily lives and to solve most everyday problems. All of the basic arithmetic calculations above, including addition, subtraction multiplication and division were done using positive numbers. The numbers on the number line above towards the right show positive numbers from zero to nine. Positive numbers are written as numbers without any special designation to indicate that they are positive numbers. Negative numbers, on the other hand, are ALL numbers less than zero, as shown on the number line above towards the left. Negative numbers are far less encountered in our daily lives than positive numbers. When the thermometer registers as 10 degrees below zero the temperature is - 10 degrees and when you overdraw on your checking account, you balance may be - $67.08 which means you owe the bank $67.08 before your bank account can have a $0 balance and it will take more than $67.08 to get your checking account balance above zero. 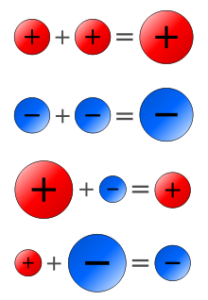 Negative numbers have the special designation of minus (-) to indicate that the number is a negative number less than zero and NOT a positive number. Additionally, when you subtract a larger positive number from a smaller positive number, the answer to the calculation is a negative number, as you can see in the examples below. Mathematical calculations with negative numbers are different from those mathematical calculations done with positive numbers because the meanings of negative numbers as being less than zero are very different from the meanings of positive numbers from zero upward to infinity. The same concepts about addition that were previously discussed with basic addition still hold true when you are adding negative numbers together or adding one or more positive numbers with one or more negative numbers. The mechanics of addition calculations with negative numbers, however, is different simply because negative numbers are not conceptually the same as positive numbers. Positive and negative numbers are different, therefore, these calculations are different. As you know, when you add positive numbers together, the answer will be a positive number. For example, 4 + 5 = 9 and 11 + 5 = 16, as shown in the diagram above. Notice that there are no special designations for the positive numbers of 9 and 16 that were the sums for these simple addition examples. When you add a negative number to a positive number the sum, or the answer to the calculation, can be either a positive or a negative number, as shown in the diagram above. In the above example, all of the positive numbers (5, 3 and 4) add up to 12 and all the negative numbers (- 2 and - 6) add up to -8. Because the sum of the positive numbers is greater than the sum of the negative numbers, the sum of all of these numbers will be a positive number and the answer is positive 5 because the sum of the positive numbers of 12 is 5 more than the sum of the negative numbers which is -8. In the above example, all of the positive numbers (6 and 4) add up to 10 and all the negative numbers (- 3, - 2 and - 6) add up to - 11. Because the sum of the negative numbers is greater than the sum of the positive numbers, the sum of all of these numbers will be a negative number and the answer is negative 5 because the sum of the negative numbers of 11 is 1 more than the sum of the positive numbers which is - 10. In the above example, all of the positive numbers (6 and 4) add up to 10 and all the negative numbers (- 3, - 2 and - 5) add up to - 10. Because the sum of the negative numbers is the same as and identical to the sum of the positive numbers, the sum of all of these numbers will be a zero, which is considered a positive number. Again, the same concepts about subtraction that were previously discussed with basic subtraction still hold true when you are subtracting with negative numbers. The mechanics of the subtraction of negative numbers, however, is different simply because negative numbers are not conceptually the same as positive numbers. Positive and negative numbers are different, therefore, these calculations are different. Subtracting a negative number from a negative number will give a negative number as the answer or difference. Simply stated using the checkbook story above, you checking account will be further withdrawn when you write a check for $40 and your balance before this check was - $25. After this check is written your new balance is - $65 and you are further in debt. Did you notice a pattern with the answers above? Did you notice that all these subtraction calculations with 2 negative numbers not only has a negative number as the answer, but the answer is really the sum of the 2 negative numbers in the calculation question. The answer or product to the multiplication calculation is a positive number when the two multipliers are both positive and when the two multipliers are positive. The answer or product to the multiplication calculation is a positive number when the two multipliers are both negative and when the two multipliers are both negative. The answer or product to the multiplication calculation is a negative number when one multiplier is positive and the other is negative. The answer or quotient to the division calculation is a positive number when both the divisor and the dividend are positive. The answer or quotient to the division calculation is a positive number when both the divisor and the dividend are negative. The answer or quotient to the division calculation is a negative number when the divisor is negative and the dividend is positive AND when the divisor is positive and the dividend is negative. Simply stated, when the divisor and dividend are the same in terms of their sign (+ or -), the answer to the division calculation is always positive; and when the divisor and dividend are different in terms of their sign (+ or -), the answer to the division calculation is always negative. Examples of division when the divisor is negative and the dividend is positive AND when the divisor is positive and the dividend is negative.